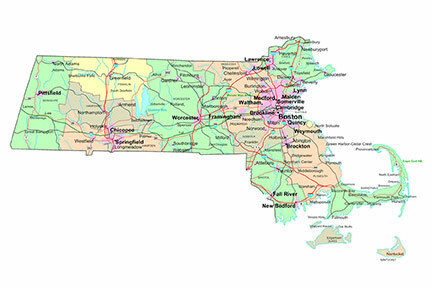 Massachusetts DUI Penalties | Consequences of Massachusetts DUI Overview | DUI Penalties Including Jail Time, Fines, License Suspension, Etc. Driver's License Suspension: Up to 1 year. Eligible for work / education hardship license in 3 months. Eligible for general hardship in 6 months. Plead to a Continuance without a Finding (CWOF). Mandatory participation in 16 week alcohol - drug education program paid for by defendant. License suspended for 45 to 90 days, or 210 days for drivers under 21. Hardship license available immediately in most cases. Imprisonment: Not less that 60 days (30 days mandatory), not more than 2 1/2 years. Driver's License Suspension: 2 years. Work and education hardship considered in 12 months; general hardship in 18 months. Driver's license suspended for two years, work and education hardship considered in one year; general hardship in 18 months. Ignition interlock device must be installed in vehicle for 2 years at defendant's expense as a condition of any license reinstatement (including hardship license). Note: If your prior OUI offense occurred over 10 years ago, a skilled Massachusetts OUI attorney would likely argue for a "24D disposition." A 24D disposition carries the same penalties as First OUI, Alternative Disposition. The Registry of Motor Vehicles, however, still treats you as a second offender. Imprisonment: Not less than 180 days (150 mandatory), not more than 5 years State Prison (felony). May be served in a prison treatment program. Driver's License Suspension: 8 years. Work and education hardship considered in 2 years. General hardship eligibility in 4 years. No hardhship license for additional 5 years if you refused the breath test. Ignition Interlock Device: Must be installed for 2 years. Imprisonment: Not less than 2 years (1 year mandatory minimum), not more than 5 years (felony). Driver's License Suspension: 10 years, work and education hardship considered in 5 years; general hardship in 8 years. Imprisonment: Not less than 2 1/2 years (24 months mandatory minimum), not more than 5 years (felony). Driver's License Revocation: Driver's license revoked for life. No possibility of a hardship license. The skilled Massachusetts DUI lawyers on this site can help you with all aspects of your drunk driving arrest including: further information on DUI penalties, fines, and consequences, administrative driver's license suspension or revocation, Under 21 DUI Drunk Driving and Zero Tolerance Laws, SR-22 insurance, DUI School, Mothers Against Drunk Driving (MADD) Victim Impact Panels, how to beat a DUI, Ignition Interlock Devices, SCRAM Continuous Alcohol Monitoring Device, DUI Expungement, DUI Diversion, Community Service, and all other issues surrounding your Massachusetts Drunk Driving DUI Arrest. Massachusetts DUI Attorneys can help fight for your Rights following a DUI arrest in Boston, Brockton, Cambridge, Fall River, Lowell, Lynn, New Bedford, Quincy, Springfield, Worcester, or anywhere else in Massachusetts.